Mythical creatures can deliver very real action in Ways of the Phoenix, a Chinese legend themed video slot from Playtech. The action starts out on a 45 ways to win machine but successive wins unlocks symbol positions and increases the ways to win up to a maximum of 3,125. There’s also a free spins round where unlimited free spins are on offer. Play on your PC, tablet or mobile from between 25p and £100 per spin. Despite all the moving parts, the design in Ways of the Phoenix is pretty good. With giant Phoenix and Dragon symbols watching over the action, you’ll see gemstones plus coins, scrolls, a drum and dragon spinning around the reels. The best payer is the Phoenix which will get you 20 times your bet if you land 5 on adjacent reels. There’s also a wild (the golden claw and ball) that can hit anywhere. Those reels start in a 1x3x5x3x1 formation. Land a winner and frozen symbols unlock which increases the number of ways to win. A losing spin sees the number of possible paylines drop. This is called the Rising Kingdoms feature. The other feature on offer here is the Phoenix & Dragon Free Games feature which is triggered by landing 3, 4 or 5 scatters on the same spin. As well as an award of 3, 10 or 50 times your bet, you’ll also receive 8, 20 or 50 free spins. Once again, a winning spin unlocks frozen symbols. Unlike the base game, a losing spin doesn’t refreeze symbols and bring down the number of ways to win. If you manage to unlock all the symbol positions and open up the full 5×5 grid, the game engine will offer 3,125 ways to win. You can re-trigger more free spins here too. Landing 2, 3, 4 or 5 scatters adds another 2, 8, 20 or 50 free spins to your tally. The good news is that you can retrigger the feature infinitely. With the shifting reel patterns, Ways of the Phoenix looks more complex than it really is. It’s actually a very straightforward video slot. The highlight is definitely the free spins round. We managed to hit them regularly and enjoyed some steady rather than spectacular results. We’d put the volatility in the medium to high range. This take on the Chinese myth theme is nicely done. 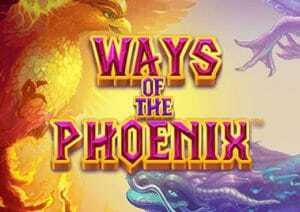 If you like classical Asian games then Ways of the Phoenix is certainly worth a spin. I would also recommend NetEnt’s Vikings which starts with 243 ways to win and can reach 78,125 in the feature!